Do you Need Vacation to the Natural area? Batu Raden at Banyumas, Cental Java Indonesia is one choice to vacation. Batu Raden is one of the prime attractions in Banyumas, Central Java. Since 1928, Batu Raden is known as a tourist attraction of the mountains. Visitors can enjoy the beauty of natural scenery and the cool mountain air with a temperature between 18 ° C-25 ° C. In good weather conditions and sunny, the view Purwokerto, Nusakambangan, and Cilacap coast can be seen clearly from the top of Baturaden. Let's Travelling to Batu Raden - Banyumas. Batu Raden name comes from two words (Javanese), namely Batur (hill, land, friends, servants) and Raden (nobility). When combined, the words "Stone Raden" can mean: flat land or the land is beautiful. There are two versions of the history of Batu Raden, namely Sheikh Maulana Maghribi version and the version of the Duchy Kutaliman. According to the first version, Sheikh Maulana Maghribi, Count Rum originating from Turkey and the Islamic religion, never felt curious about the mysterious light that towered into the sky and shining in the east. The Prince then look for the origin of light. Long story short, after making the climb to the top of a mountain, the prince saw an ascetic Buddhist who rely on a guava tree that emits rays of light upward. This location is then known as Batu Raden. Meanwhile, according to the second version, the story Batu Raden associated with romance between the Duke's daughter Kutaliman with aides who keep horses. Total land area attractions Batu Raden area is 16.5 ha, with an area of ​​4 hectares of land investment. Status of land is HPL (rights management) Local Government (Pemda). 1. Botanical Garden. This park provides a variety of ornamental plants, plants bongsai, and rare plants, such as Havana Plants, Leaves god, Brimulia, rodent tuber, Antarium Lipstick, Palm Paris, Tongue Elephant, and Widoro Sea. Price of these crops is quite cheap and can be reached by visitors who want to make it as a souvenir. 2. Curug Gede. Sightseeing Tours is located in the Village Ketenger, the distance is about 3 km from Batu Raden. There are a beautiful waterfall. 3. Shower Pitu, a distance of 2.5 km from Batu Raden. This shower is located 2.5 km from Batu Raden. This shower is a source of geothermal water with temperature 60 ° -70 ° C, which directly flows from the foot of Mount Slamet through seven showers. 4. Telu shower. Shower was inaugurated on January 18, 1987. This shower drain hot water with a temperature of 40'C sulfur which is said to cure skin diseases and bone. 5. Wana Wisata. Sightseeing is located 2 km from Batu Raden. Wana Wisata presents a view of green forests and beautiful. This place is perfect for camping activities and jungle tracking. 6. Silent Lake. 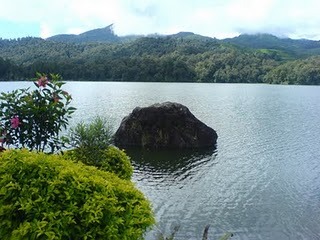 This lake is located on the east, a distance of about 3.5 km from Batu Raden. Is somewhat beautiful lake, the water was clear and cold. 7. Park Kaloka Widya Mandala, which is a zoo tour as well as education. In this park there are a number of animals brought in, both from domestic and abroad, such as leg three goat, elephant, monkey, cow foot five, python, monkey, porcupine, crocodile Irian, orangutans, and deer. In this tourist complex also contained Endangered Wildlife Museum which contains animals such as sun bears, Sumatran tigers, and clouded leopard. 1. Grebeg Shura or Alms Earth. The ceremony was held on the 9 Months Shura. The purpose is as a starting reinforcements, namely by doing such activities ruwat earth and salvation at the tombs of their ancestors. 2. Kenthongan, is a typical musical arts Banyumas. The main tool of this art is a form of pieces of bamboo Kenthong a given hole in the side lengthwise. To play it necessary to punch with stick. 3. Calung and Lengger. Calung is also a musical instrument made of bamboo pieces, placed transversely, and played with beated. While Lengger is a dance that is played, two women or more and accompanied by calung. 4. Banyumas traditional clothes. Banyumas traditional clothes are of two kinds, namely clothing for the underprivileged (like clothing ancingan, bebed wala, pinjungan, iketan, and nempean) and clothing for the nobility (nyamping beskap for men and for women). 5. Ebeg (kuda lumping). Banyumas Ebeg a traditional dance with his trademark braids using the horse. The show is usually accompanied by gamelan called Bendhe. 6. The exhibition of ornamental plants, such as havana, god leaves, and palm paris.